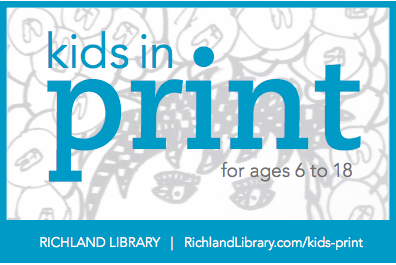 Richland Library is currently accepting submissions for its literary magazine, Kids in Print, which showcases the talents of young people across the Midlands. Children and teens ages 6-18 can submit their poetry, stories, short plays, essays, drawings, photographs and more. Kids in Print is not a competition, but with so many submissions, we are not able to publish everything. We try to include a variety of creative work that is original, well-crafted and contributes to the overall collection. Children and teens may submit their work by printing out a submission form. Submissions are accepted at any Richland Library location. Contributors may also submit their work via e-mail (see directions below). All submissions must be received by January 12, 2017 to be considered for publication. Congratulations on being brave and expressing yourself--whether you're published or not, you've succeeded! Mr. Durden is willing to collect paper and digital entries from students until Tuesday, January 10th (Bookman Beacons) and Wednesday, January 11th (Langford Labs). There is no entry fee, but I will need family permission to send in student writing and art. I intend to scan any artwork so I can return the originals to families. If you complete your writing or artwork after these dates, you are still welcome to submit it to Kids in Print with your family's help until Thursday, January 12th.